One downside to the automotive hobby is that it is generally one big sausage fest and when an adventurous woman does try to break into the scene she is either not taken seriously, hit on relentlessly, or both. Some women however are dedicated enough to persevere past the nonsense and carry on. 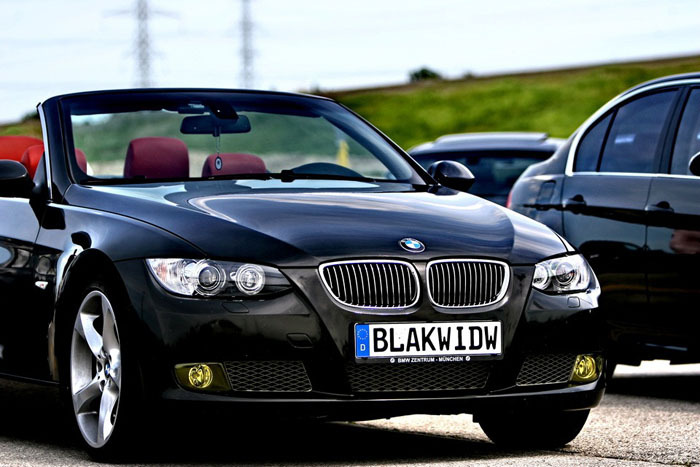 Stephanie, the owner of this feature ride, rolls her Black 335i with vanity plates the read Blak WIDW (Black Widow) and like a black widow spider she isn’t to take lightly. Not only does she roll with punches of the male dominated maxbimmer.com crowd better than a lot of the fellas, she also drives a car that is so tastefully modded that it has a few guys rethinking their modifications for next year. Stephanie is no stranger to the automotive scene, she’s been modifying cars since she was of legal to drive (16 for you out of town folk). Her previous ride was a hand built boosted Civic that laid waste to anyone ready to underestimate it and her. 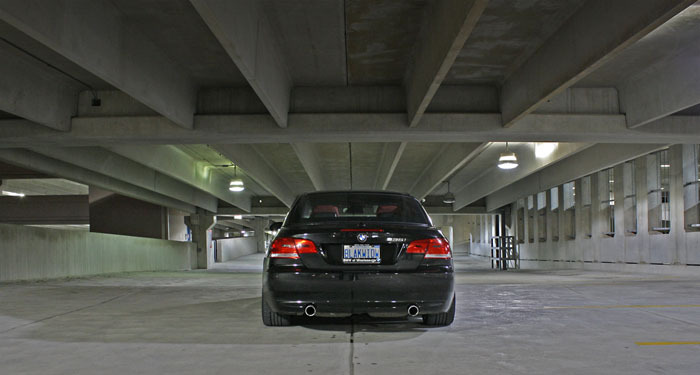 After being part of Civic nation for a few years Stephanie made the jump from Honda to BMW with a slammed (black of course) e36 convertible, and then upgraded once again to her current 335i. 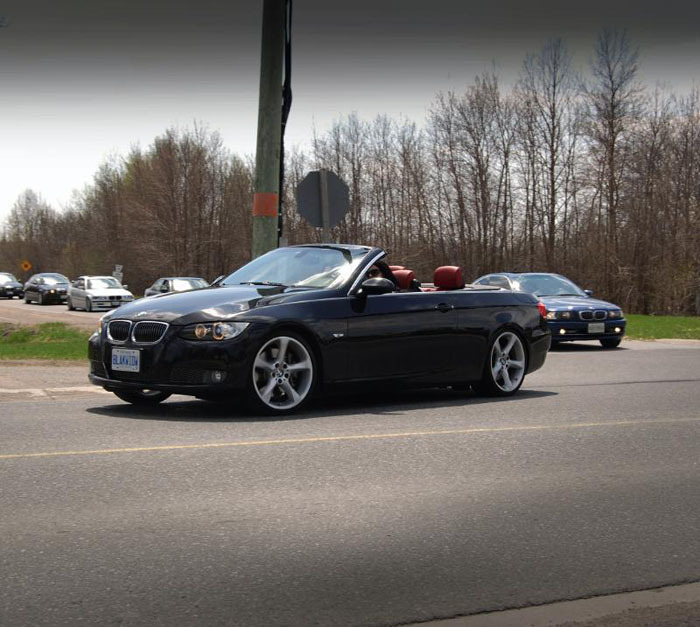 Stephanie’s BMW started out mean, shipping with black sapphire metallic paint, a premium sport package, and a coral red interior (with aluminum accents). Putting down 300hp/300lb of torque as it rolled off the lot this car was no slouch either but considering how it looks and performs now its a wonder why the designers at BMW didn’t consult Stephanie before rolling out the concept. 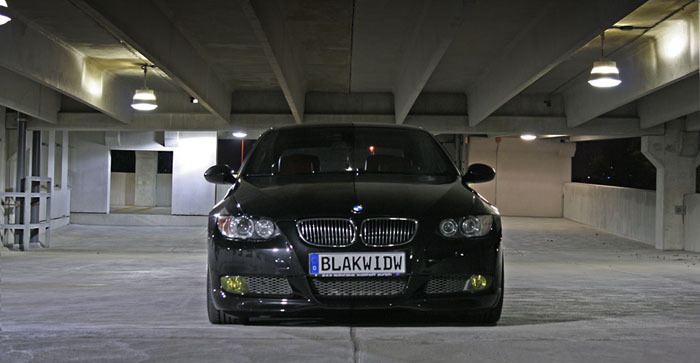 The exterior was upgraded with an OEM BMW Aero-lip, yellow fogs, tints, and shadow lined trim. 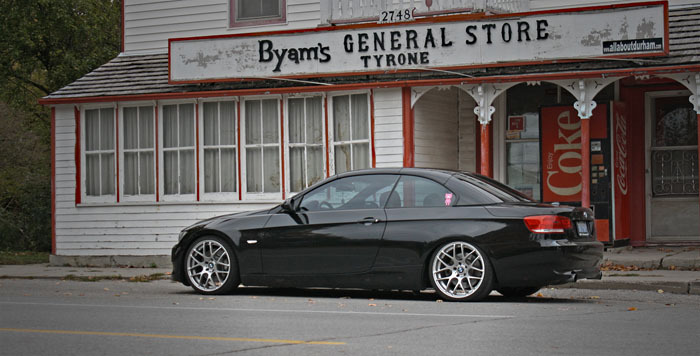 After having some issues with the stock wheels cracking repeatedly the rims were next to go with 19″ staggered VMR V710 wheels (8.5″ front with 225/35s and 9.5″ rear with 255/30s) taking their place. Once the wheels were installed H&R sport springs were employed to bring this car down. Motor wise a Jb chip helps this motor put down numbers in the range of 400hp. 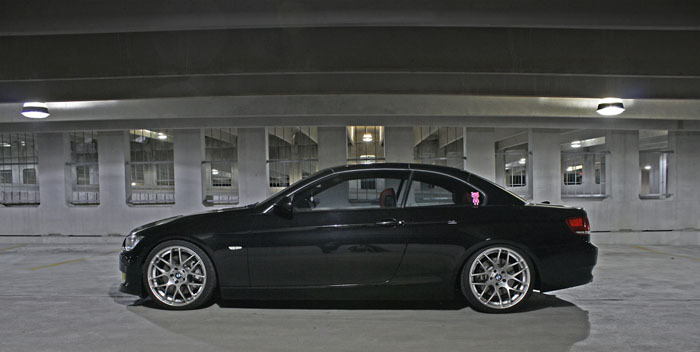 The stance on this car is impeccable. Having grown tired of the drag racing scene Stephanie’s next modifications are more lapping focused and include: KW V3 suspension, an upgraded front mount inter cooler, downpipes, and a full exhaust system. Big thanks the Stephanie for submitting in a great set of photos for her feature and a nice list of modifications which made writing this feature a breeze. 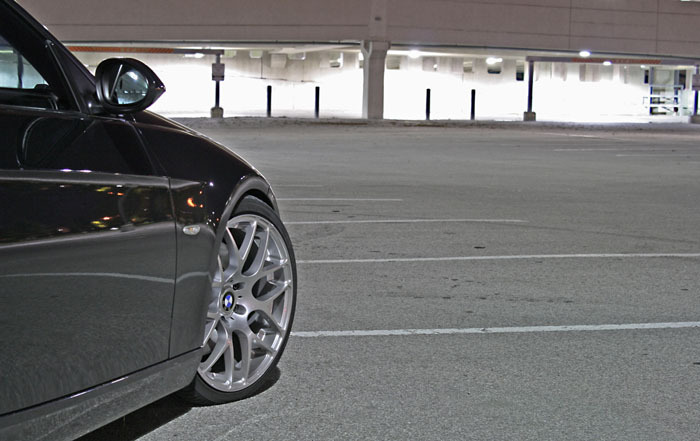 If you want your car featured on stanceiseverything.com just drop me a line at [email protected]. It’s really disheartening to me that I don’t know many other girls into the hobby. There are some women that autocross here, but, well, they’re like twice my age and have been doing it forever, ha. Some that I do find, then, are snobby about it… Which is sad. I’m digging the amount of girls on the site latley! Wicked article Dave. Stephanie definitely has a wicked car. We cruised for a bit on Airport Rd. one night. You probably don’t remember, but I drive the black Civic coupe with the roll cage in it. I turned on Queen and you kept going straight. 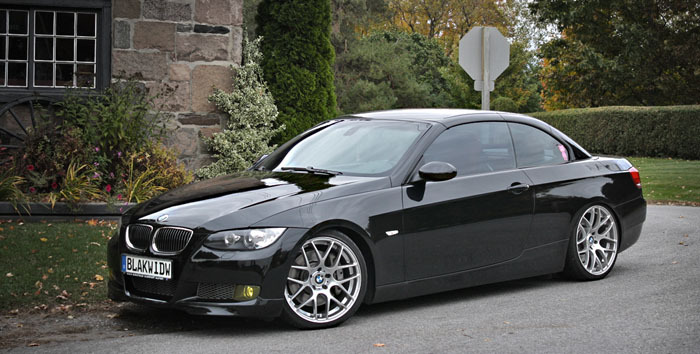 Anyways, this car is gorgeous! Pics do not do justice for this car. nearly as nice as the white/black e92 m3 i saw there last week.